The new Mechadrome Kickstarter is live now! Head on over to learn more about the game and see what we're offering, and pledge your support! 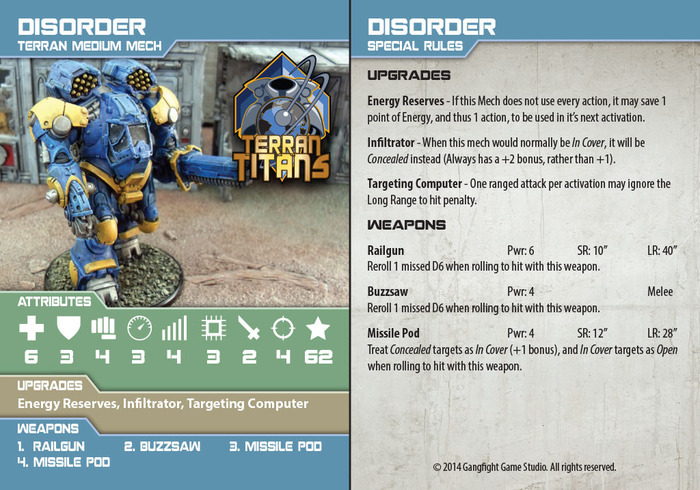 You can also visit our website at Mechadrome.com to for more info and to download the free playtest rules. I put a note on the preview page regarding the add-on packs. I didn't see any info on shipping on that page, though- the info you added here regarding shipping is very helpful, so that should definitely be on the main page somewhere. I obviously like that you're offering free shipping on orders over $100 in the US, and the $10 international shipping credit is good because it is equivalent to the US shipping. However, I've seen that folks really want to know what it will cost to ship internationally, or at least an estimate. So, getting that ready before launching is a good idea, too. It's insane. However, first class international shipping is much more reasonable. I would highly recommend using first class shipping, instead. Since the price hike, I have switched to solely first class for international shipping, and have not had any issues whatsoever. Exactly, no point paying for a box that could weigh up to 4 pounds when you're shipping resin! You can't keep a good Mech down! The Terran Titans are back and this time it's personal. 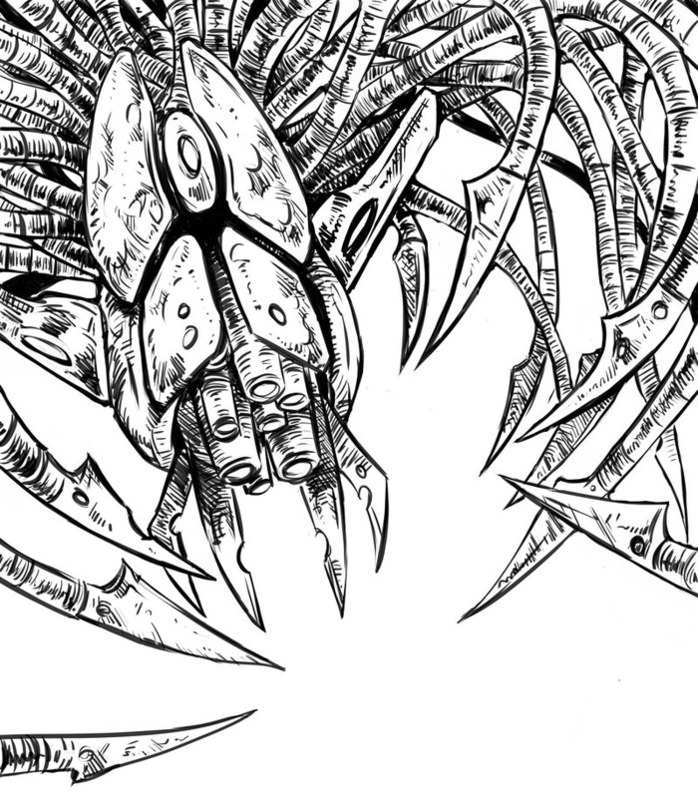 Bigger, badder and with more weaponry, Monday Night Mecha just took a power punch to the metal-encased ribs. I'll be in for $150! I did lots of price calculating on usps.com for places like the UK, China, Brazil and Australia, pretty much the same price everywhere except Canada which is cheaper. I think I'm just going to make it a max rate for all... $20 shipping to the UK for any pledge amount, and $15 to canada. That's an estimated price, in some cases it may be cheaper when you do the pledge manager check out, like if you're just getting a rulebook and that's all. You gotta post those scale shots up again! Wife has been busting my chops about too many figures, too many games, too many books... thankfully I never heard her mention too many mechs. I'm in for one at the very least. Added the scale shots I had to photoshop the 2 different old photos together, but it should do for now. Once I get the master samples for the medium mech I can take a new pic. That shipping plan sounds like a good one, Necros, and if you apply the $10 shipping credit for international backers who pledge $100 it looks pretty generous for all. Just make sure you've covered your costs! But using first class mail definitely makes it so much more affordable. No shipping credit, just the max charge now. I was thinking, if shipping would cost around $20 for orders under $100, and $30 for orders over $100, then the $10 credit just makes it $20 no matter what. So rather than all the adding and subtracting I figured it would be easier to offer a "$20 max shipping" coupon code to the international backers. Looks cool! Will you be including the Proxie Models items this time around too? I'll probably be in for a single mech. If we go in for just a single kit, will we be able to choose the arm/equipment loadouts, or is it just what's available in the pre-selected loadouts? Yes you can do custom payloads I thought it would be easier for most folks to just pick the pilots they want. But what I was going to do, in the pledge manager I'll have it set up where you can select the weapons you want with dropdown menus, kind of like the way you would select a tshirt size or color from online stores. Planning to hit the launch button tonight after Game of Thrones But I guess technically tomorrow will be the first day, I don't think any news sites will be posting the links till then anyway. Sounds good to me! I know you have a few freebies listed, just be conservative with them and make sure this covers your costs. Will be putting in a pledge for two sets of 3 mediums (6 total). Good Timing, Amazon Payments is down. Hmmm... now I can't even get Kickstarter to load. I'm totally going to support this... the mechs look plenty wicked gnarly awesome... Just have to do some calculations and forecasting to see if I'll be able to allocate funds to this by the time the funding date comes around. Well, I wasn't the first, but I least got to be in the first 5 backers! Time to go collapse in a heap in a corner after being stuck in the sun all day with the kids at Disneyland. Alright, I think I'm backer #10. not bad. I'll be wanting a drill-bot, please. Thanks folks Off to a great start so far! 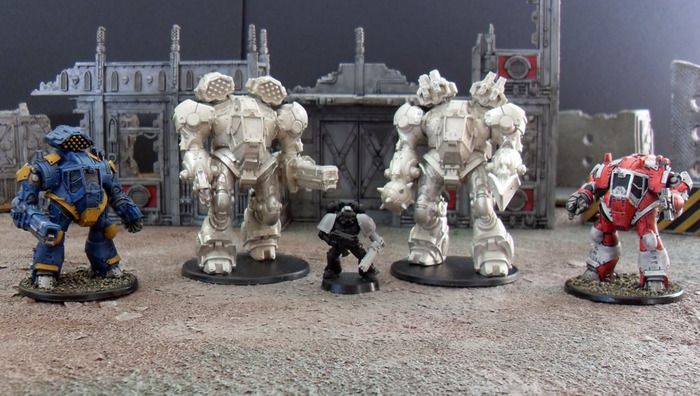 The prints for the arena hazards and alt light mech poses have arrived, and here they are! Sorry if the details are tough to see, the material was transparent this time, so it doesn't all show up as well as the blue color the other prints had. I stuck the medium mech bodies in there just for scale. Some backers have been asking for photos of the weapon pieces, so here they are! We have the light weapons followed by the mediums. The mediums have less pieces overall since most weapons are just the forearm while the light mechs have whole left & right arms. 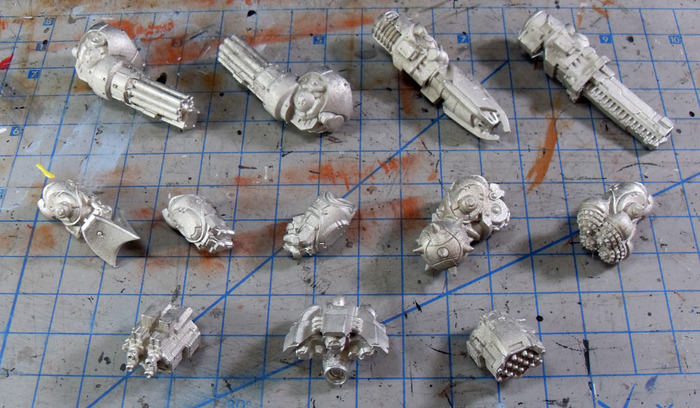 From left to right we have Railguns, Chainguns, Blasters & Plasmaguns. Then Jackhammers, Crusherfists, Siege Drills & Buzzsaws. On the bottom there's booster jets, shoulder armor plates and a missile pod. Here we have Left & Right Chainguns, a Plasmagun and Railgun (for either arm). Next is the Jackhammer, Left & Right Crusherfists, Wrecking Ball and Siege Drill. On the bottom there's a Blaster turret, booster jets and missile pod. So, will the arena hazards be a neutral fires-at-anyone-who-comes-close type of thing, or will a team be able to invest in some gun turrets of their own? Yes and yes! Hazards can "spawn" in the middle of the arena and will attack the nearest mech, those will be in the objective cards. And you can also add them to your team, but since they are automated all they can really do is attack, you can't use them to capture objectives or anything other than extra firepower.. but the fame points are pretty low, so usually 2 hazards will be about the same as 1 light mech. Over the next couple of weeks I'm going to be posting individual pilot bios along with a sample of their pilot card art, one each day or so. At first I was going to do one large update with each team, but I thought 1 pilot a day would be more fun So, here we go! Buzzkill's famous career began in the dark period when Mechadrome was more violent than the wars it was designed to replace. Discovered in one of the many thousands of scrap-settlements, foraging off discarded military hardware and selling what she found for food, Buzzkill was quickly signed by the Terran talent scout Hamazdian Cole. Impressed by her natural tactical presence of mind that allowed her to evade capture for several days, Cole immediately started her on a rough regime of Mech combat drills, arena awareness and team tactics. 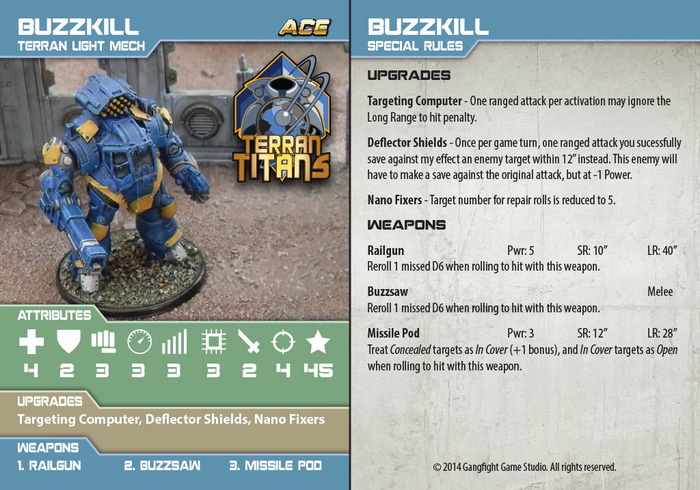 Kitted out with both close and ranged weaponry, Buzzkill delights in distract and hold tactics, keeping opponents either hunkered down under a deluge of missile strikes while other team mates flank them, or grappling up close with her buzzsaw, before falling back for more powerfully armed Mechs to finish them off. The cards look pretty cool, as well. 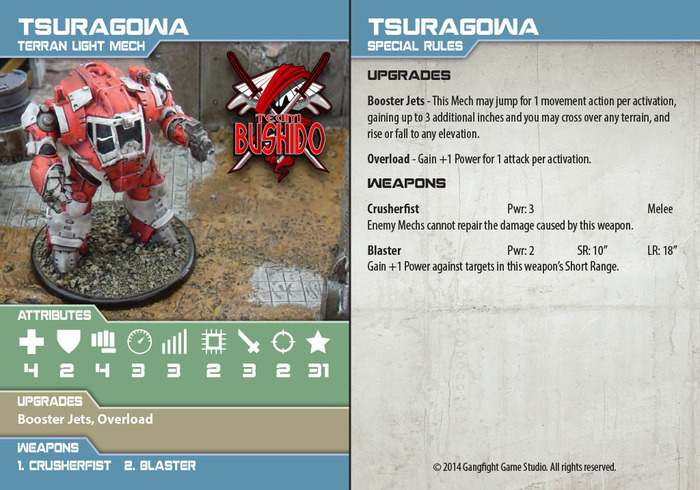 Next up, here is Tsuragowa of Team Bushido! Raking the ground with blaster fire, Tsuragowa roars from the sky riding twin contrails of booster jet flame right into the heart of the opposing team. Landing amongst them, shrouded by the dirt and debris kicked up by his weapons fire, ‘Rag grabs hold of the nearest enemy Mech, gripping tight and laying in with some close quarters fire. If he can, he uses his boosters to keep them off-balance, jinking one way then the next, long enough for their systems to start to power down due to overload. And then he’s off to the next engagement, just another prime example of Team Bushido’s infamous hit/run tactics. I think the total of almost $6K is good for this point in the campaign, but I do hope it picks up a bit in the final week or so to reach $10K and cover your expenses. I'm tapped out for now with 6 medium mechs, but I will hopefully be adding some arms in your online store after the campaign. Havoc joined the Titan's mid season '16, replacing StrikeZone who fell to a vicious Jackhammer and siege drill assault by Bushido members Makuzo and Kessen. Taken from the training pool of would be Titans, Havoc quickly became known for using his missile pod as a distraction and then nimbly shifting positions to spray the area with twin chainguns. And he's no shrinking violet either. Despite receiving warnings from Titans management, Havoc can always be found on a vid-cast both before and after a match, holding interviews and flirting with the audience. He's also the only Titan to actively encourage sponsorship - his Mech is often decorated with advertising holoscreens or simple posters - yet another thorn in Titan owners sides. But the crowd love him, and pay to see him and so, for now, he stays. 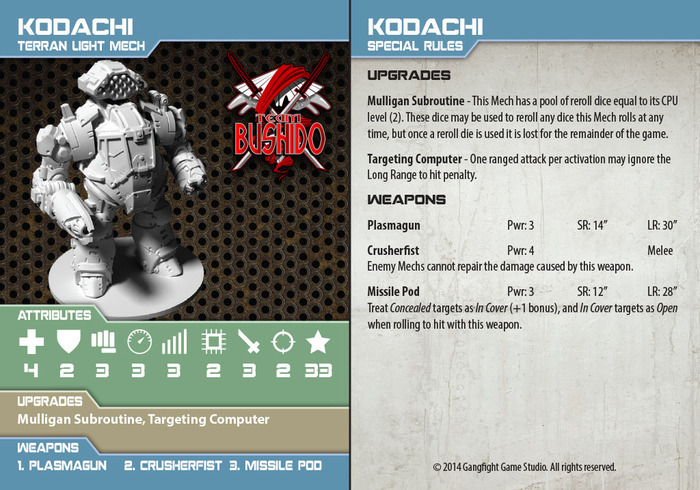 The baby of the team, Kodachi has still to prove himself in the arenas. Taking over the coveted spot from Jakumota “The Flying Devil” Cannut following their violent retirement when his Mech imploded thanks to a faulty experimental grenade. In the six games Kodachi has taken part, his performance has been “variable” as Team Ace Yari commented in the post match interview with Station 27. There is no separation of this psychotic pair of aeronautical experts. In their former lives they were cargo-pilots for Sienko Industries, flying freighter ships between the planets of the Galactic Council. Some held supplies - food, medical and much needed tech - while others were nameless containers and sealed orders. A destination and a timelog were all they were given, but the financial rewards they received for these type of assignments more than made up for the hazardous conditions they flew in. However their luck ran out when transporting a sealed container to the Mankali Research Planetoid. A sudden meteor shower tore through their guidance systems forcing them away from their destination to the nearer moon of Salin IV. A pleasure colony for the super rich, the moon was a resort that catered to every desire. With engines on fire and bleeding atmosphere, the duo somehow managed to pilot the freighter away from the habited zone, crashing into the surface and spilling the contents across a vast area of dense forest. In horror, the two discovered their cargo was not medical instruments or supplies but instead twenty-seven humans infected with bionic-tech. What happened next became known on Tri-Vids across the Galactic Council worlds as the “Massacre Of Salin IV”. Thunderstrike and Lightfoot became wanted men and had to flee into the shadows, pursued by agents of the Council. MechaDrome became their new home and the anonymity their Mechs provide, a new uniform. Kitted out with booster jets, the pair swoop around the arenas, letting loose a torrent of destruction from above, earning their crowd pleasing tactic the nickname: “Death from the skies”. I'm really loving the look of the plasmaguns. Pinching a few pennies to get in on this in a couple days. Another fast attack expert, Soto stands waiting for the signal to attack. Shadows are his friend and he barely registers on the heat-tracker systems used by Arena cameras to stream vid of the match. Heaven knows how opponents are supposed to keep a bead on this formidable close quarter specialist. Once a target has been established, usually by being knocked out into the open by heavy fire from a teammate, Soto powers up the twin siege drills affixed at the end of each arm. Once the target corridor has been established, a quick flick of a button and the booster jets are fired up, launching Soto straight at the unfortunate Mech. Seeing the debris clouds of metal and poly-heated plastic explode around the doomed opponent and you know there are only moments left before another Kill is knocked up for Soto whose attack/kill ratio is riding high at the top of every league. To say Disorder has issues is an extreme understatement. Even the Team psychologist has given up on getting to the root of her issues, having way too many broken bones and bruises from their therapy sessions. Whatever the cause may be, that Disorder is armed to the teeth with a dangerous buzzsaw/railgun combo backed up with twin missile pods is welcomed by the crowds that pack the arena viewing hubs every time she strides out. 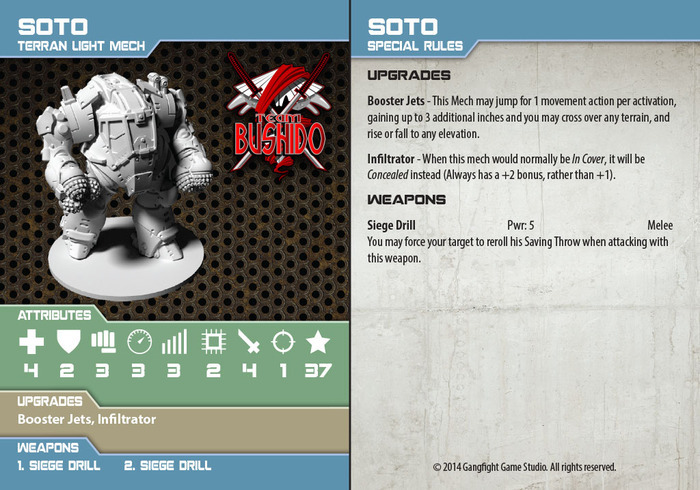 Working alongside Soto is Yari, another close combat specialist. While Soto likes to rip the opponent apart, Yari instead prefers to pound them into the ground with one of the powerful jackhammers liberated from one of the construction mechs. Coupled with Pounder HE missiles this style of attack is known as “pounding dirt”. During the final of MD’89 when Yari was caught in an hab-construct surrounded by Thunderstrike and Lightfoot, and with no obvious way out before they began their attack, Yari used the jackhammer to pound into the floor. As they Terran pair obliterated the building with blaster fire, missiles and plasma, Yari jackhammered an escape tunnel, appearing 200 feet away behind them. A few well aimed missile strikes crippled the Terrans, giving Yari enough time to make it back to a friendly zone in the arena. We asked for a proper measurement picture! You're supposed to lay the ruler down on the ground, remember? Jeez. Still have to figure out what arms I want for my machine. As a fan of funky designs, I hope once the initial game gets out in the wild, we see some of those later stretch goals get produced as well. Maybe take a poll? I could go either way but a second faction seems more important than another mech option, despite the heavy being awesome. I can probably get away with picking up a light or medium now and then versus drawing the ire of the other with the purchase of a larger mech, as she tends to gloss over anything under 30 spent by me. Yeah that's probably the best way to go. I'll see what Dave thinks. I'm hoping I can afford the lights and mediums together.. I should be able to with the extra cash from the campaign Though I probably won't be able to afford any other new sculpts for other races till these start going on sale. I don't know if a 2nd campaign for the bionic mechs would be worth it, I figure if I can afford the sculpt I may as well just release them the old fashioned way for now and maybe save KS for bigger projects. That's okay, it hasn't really changed in months (except for 3 new maps) so you haven't missed much . I'm much more looking forward to seeing your "Titans" on the tabletop! I think it's about time I finally got one of those airbrush thingies. Thanks Now I actually have to get to work. We aim to please . It makes sense, though, since these would make fantastic counts-as for 28mm wargaming, in addition to their intended use. Looking forward to seeing things progress! In other news, I'm working on painting up all of the models for the rulebook and I have some artists working on some new illustrations too. I'm planning to have everything done by september, as it will take about a month to get the books and cards all printed up. Lots of work to do, so I better get back to it! Congrats! It looks soooo good! You are welcome to come out to my workshop to check out some different airbrush set-ups and get the crew to assist with any terrain projects. We are in high gear for the rest of the summer and can easily help out. I'll be sending out the store credit gift vouchers to all of the backers next week after all of the pledges have been collected. Now I'll be in painting mode till I get both teams finished, since I need them to be able to finish the rulebook and pilot cards. Hoping to have everything done around September, since it will take about a month to get all the printed stuff done. All of the pledge rewards are listed in the Mechadrome menu. You can select by your pledge level, or just pick individual items if that's easier for you. I'll also be updating the photos as I get new models painted up. Due to the limitations with the online store software, I have to make some changes to what I was planning to do. Instead of emailing you a gift certificate code, what I'm going to do is create a store account for you with the name and email address you put in your survey response, then I will apply store credit directly to the account and I will email you personally your account info and a generic password. Then you can log into your account with your email address and change your password and add any other info you want, and then go and select your items. You will see your store credit listed when you check out at the very end, you will have the option to apply your store credit to your order, and then pay any extra balance with paypal if you added any new items. Lastly, I have to change the way the shipping charges will be handled. For some reason I'm not able to do a "max price" shipping like I originally hoped, it will only let me set a fixed price.. so if your fixed price is $20, but it would really only cost $15, you would end up having to pay the full $20 no matter what.. and that's not cool. So, like I originally said I'm going to give free US shipping for orders over $100. That will basically be around $10 for most orders, so what I am going to do is create a "rest of the world" coupon code for $10 off shipping for orders over $100... so it will basically be the same discount the US folks are getting, and that should also be able to keep the prices at the levels I was hoping to do originally. Sorry about having to change that, but I think you'll see the prices with the discount will still be reasonable. It's open to the whole world, so if you didn't back the campaign you can still go in and preorder anything. I'll hopefully be adding all of the BWG miniatures to the store soon too right now I just have a few rulebooks at the moment. 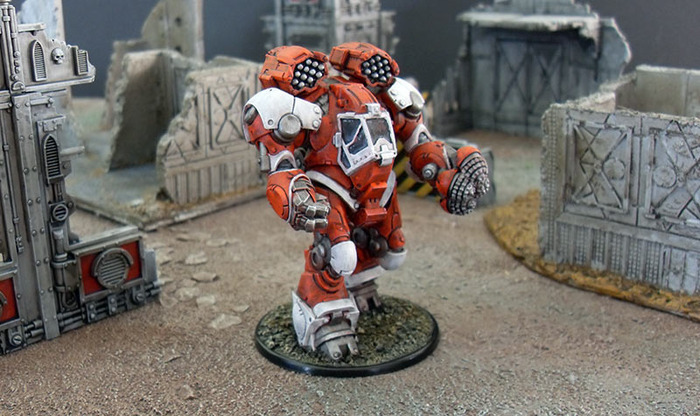 Is there a list of all the mech options anywhere? Also a list of the pilots and their equipment? Awesome! I started digging around on the page and found the mechbuilder- so my pledge is paid for and done. I regret not adding a missile drone or three to my order though. I can always get a small army of them later right? Yep I'm going to be adding them into the rules as part of your team rather than just a little thing that pops up in the middle of the arena and attack anything, and in your team organization 2 drones = 1 light mech. So that's why I changed the name to drones instead of hazards. I'm also going to be doing an all new "starter set" for retail so the price will be cheaper, those will have 2 drones and 1 light mech. Terran Titans will get the rover drones and Team Bushido will get the crawlers. You can have any kind of drones on your team, I just thought having a different kind in each set will just look better for variety. I'll still do the different bundles on my site though. I have some rules updates I'm working on.. I don't know if I'll have the time to make a new PDF rulebook for a while though, I'm real busy with the painting and updating the main book.. so I'll probably wait and do an all new PDF at the end when everything is done.. it will be stripped down and mostly "just the rules" like I did with Blackwater Gulch, so the printed book is nicer and has more content. Anyway, I've mentioned before that the retail starter sets are going to be 1 light mech and 2 drones (instead of hazards). Drones are little automated systems that don't really get added to a team's roster like a pilot, instead any mech can take up to 2 drones for 15 points each and form a little squad with them. Drones have to stay within 12" of the Mech they are with, but otherwise will work like a separate model.. so they're not like other games where everything would have to shoot at the same target. If a drone ends up out of range it will have to move to be within 12" first before it can attack anything. And if their leader mech gets blown up they will go on auto target mode where they go straight for the closest enemy and attack em. Hey folks... Time for another update! I just heard from Iron Wind, they're just finishing the samples for the 3 new light mech poses and the drones, I should have the metal samples this week and I'll take some pictures when I get them. I've been doing a lot of painting.. since I didn't have those alt mech poses I decided to paint up the arms and other pieces ahead of time since I did have those on hand, so that will save some time later. Also, I just finished painting Kessen. I just updated his photo in the online store, along with a new battle pic for the homepage. I also just got ahold of the Mantic ruined quadrant battlezone set, and it's really awesome. I highly recommend their battlezone terran for your Mechadrome arenas It's perfect. After I get all the mechs painted I'll be building all of that up for the photos for the rulebook and more. Here are a couple of photos of Kessen. I'll be working on Painkiller next, I should have him done later this week. Love Kessen's configuration, I'm planning to build some like that . Do they look okay with no top-mounted weapons? Yep they look great. There will be 2 holes for the turret pegs, but they are blended in with the detail so you don't really notice it. I was originally going to have the ones with booster jets not have top weapons but it felt like they needed the extra firepower. Hey folks! I'm still hard at work, but nothing too new to report. Still, I'm going to make an update every Monday to keep everyone in the loop. I did get the new sample models in, and they look great. I'm painting them up now. I was going to have Painkiller finished by now, but I decided to switch gears and finish painting all of Team Bushido. I should have them all done at the end of the week, and then Terran Titans at the end of next week, Painting all those arms in advance saved lots of time. No shortage of projects to work on around here. 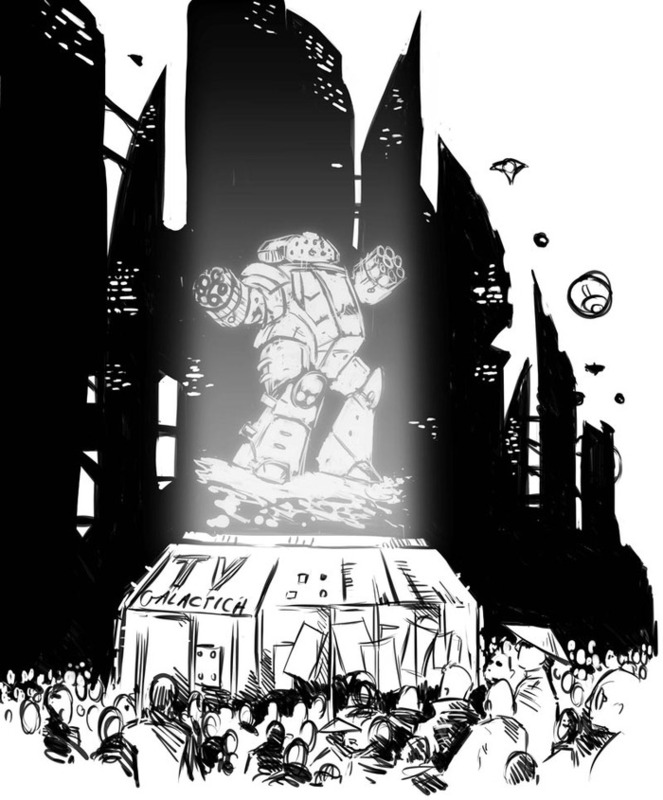 I posted a recent update on the KS page, but if you haven’t been reading there, we are going to be doing a new Kickstarter campaign to get the Terran Heavy Mech made, along with Rookie & Pit Crew squads as stretch goals. I’m guesstimating the campaign will be around August or so. We’ll be sculpting and producing the master parts for the heavy mech ahead of time, and I’ll be painting up the first couple of samples to show off in all their glory. So I’m hoping to be able to ship fairly early like before. I’m also guesstimating the price for the heavy to be around $75 USD. There will be 1 heavy for each team. 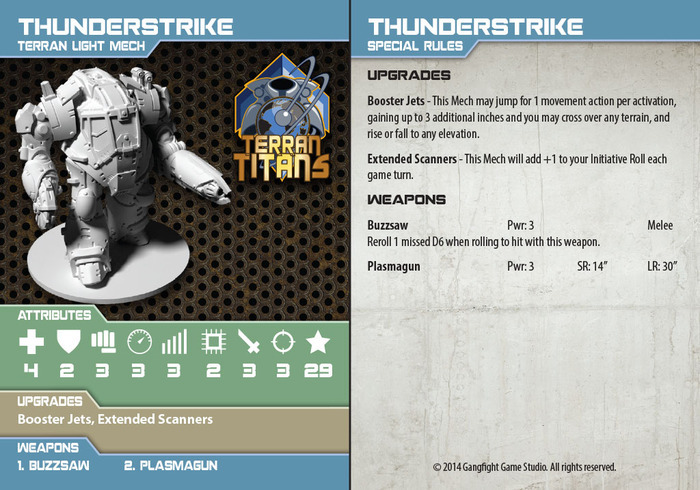 Terran Titans will get Behemoth, he’ll be armed with a Railgun, Plasmagun, 2 Chaingun turrets and 1 Missile Pod. 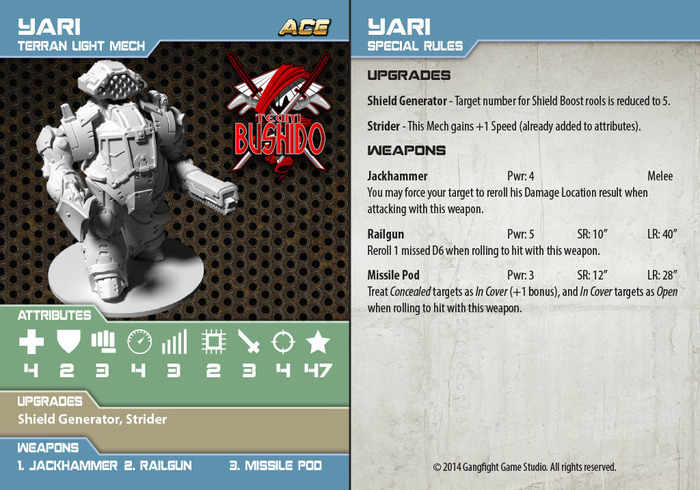 Team Bushido will get Kaiju, he’ll have 1 Wrecking Ball, 1 Siege Drill, 2 Blaster Turrets and 1 Chaingun turret. The heavy would be a bigger and badder version of the medium mech, I’m guessing around 4-5 inches tall. 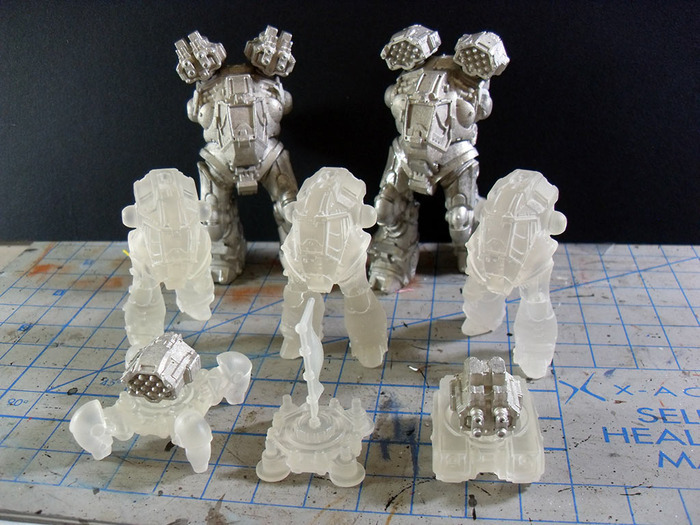 It will most likely be 100% resin, except for maybe the turrets and smaller pieces. Since there will be just the 2 pilots, I’m also thinking about packaging the both together and including all of the weapons you need for both. 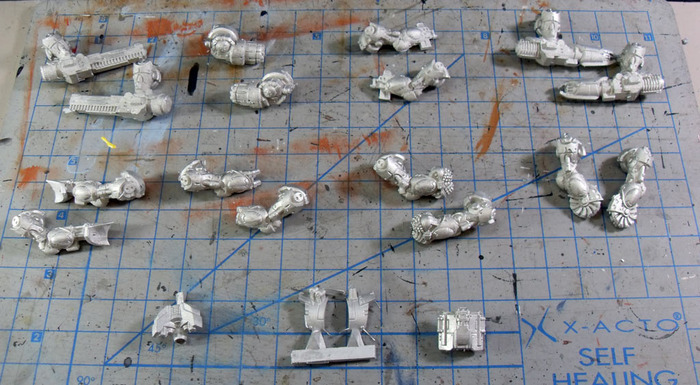 Then you can easily magnetize them or have more options to make your own pilots. If I do that, it will raise the price a little but hopefully no more than $5 or so. I’m also hoping to have the model posable, rather than doing different legs and poses like the lights and mediums. So there will be separate feet, lower legs, upper legs, etc. I don’t want to get too crazy with the amount of parts though, I’d like it to still be easy and self explanatory to build it. 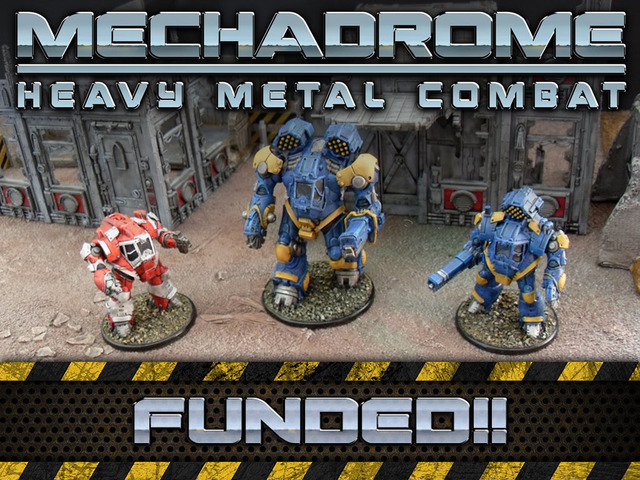 Excellent stuff, very much looking forward to laying down some cash for some Heavy Mechs...bring on August!!! So just recapping some of the stuff we’ve been chatting about on the Kickstarter page. Prints for the new Drones came in, sent them off to get masters made and I”ll take pics of those when I get them in a few weeks. Those will likely be released in August since all of Iron Wind’s customers are in “OMG GENCON” mode and I have to wait in line. We’re going to be shaking things up a bit with the different weight classes for Mechadrome Season 2. I hope to have that campaign ready to go by mid October or so. We are going to make all new Terran Light Mechs that will have a more exposed driver and be more like an exo suit along the lines of the power loader from Aliens. They will have 2 weapons rather than 3. Then, the current light mech model will become the new Medium Mech. The current Medium Mech model will become the heavy mech, and the new heavy mech we planned to sculpt soon will become the super heavy mech. The new drones will be able to form squads of up to 3 models, and the planned Rookies will be smaller models that can also form small squads of 3, basically the same rules as drones just different stat lines. The goal here is to have a lower price point to get into the game, so that the game will be more affordable overall. However, light mechs will not be required in your teams like they are now, we’ll be updating the team organization rules and basically just giving everything a point value with no requirement on the amount of mechs you need. 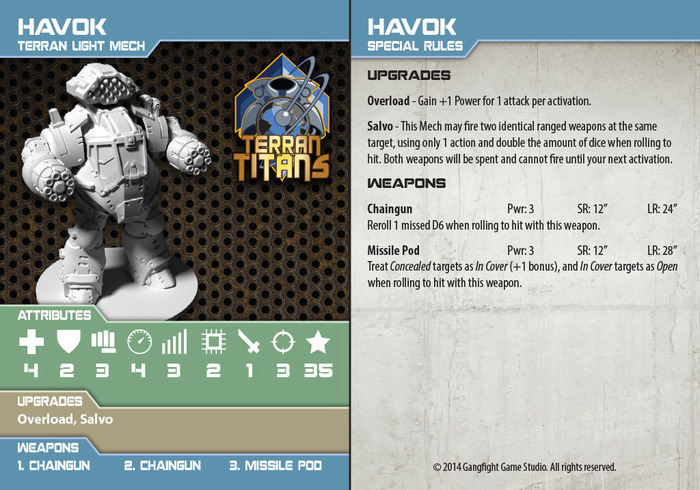 All Rookies and Drones will be 1 Fame Point each, light mechs 2, medium mechs 4, heavy mechs 8 and super-heavy mechs 16. All you have to do is make sure your points match your opponent’s and you should be fine. The new squad rules allow you to have everyone in the squad attack one target and combine their attack dice, it’ll work just like the Salvo upgrade. But again squads are only for drones and rookies. Do you plan on creating foot soldiers and maybe light tanks for each race for Mechadrome?? Understanding this is a mech based game, infantry and things like that could be scouting units. besides; the Aphid, Bionic, Martian, and Terran models would look fantastic! It's simply a suggestion. I just found this game and it caught my eye, can't wait to see more soon! Originally it was going to be a 15mm scale game and I was hoping to have tanks and flying things, but since we switched to 30mm I want to try and stick to just mechs for now. maybe some day we can, but the first thing I want to do is get the mechs all done for the 4 primary races. Tanks would have to be kind of large models, and that means expensive to sculpt and produce, so I need to make sure the game has a big enough following for that.